Yesterday, my kids and I made the most delicious dessert. 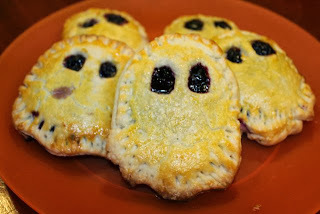 We called it Boo!Berry Ghost Mini-Pies. 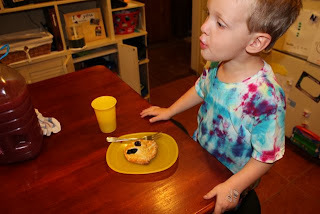 To make this dessert we adapted a recipe that we found on La Bella Cook. 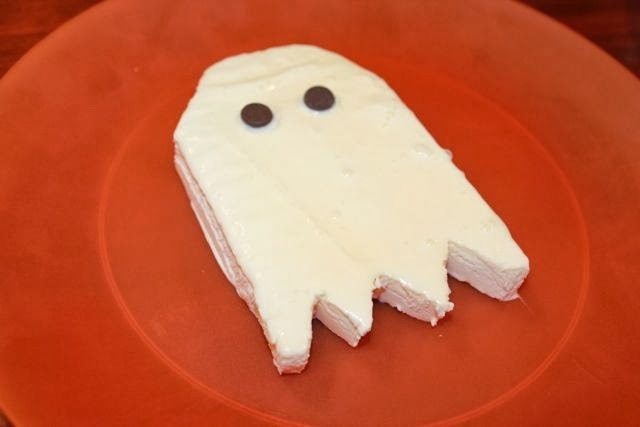 Please Pin this to Pinterest and follow the THREE GHOST FRIENDS board. 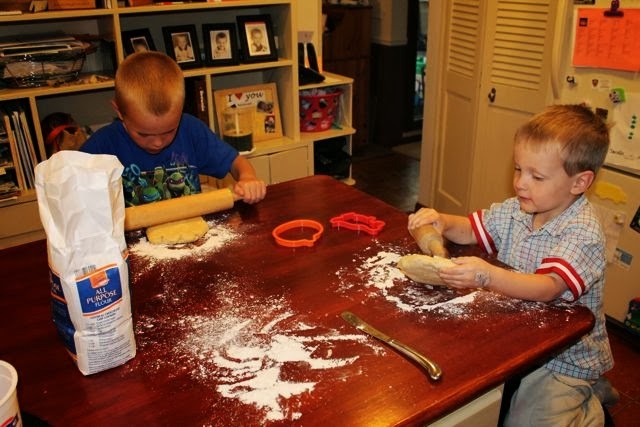 1/2 cup sugar + 2 Tbs. 2 sticks of butter or 16 Tbs. 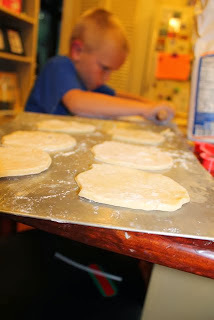 Add 2 1/2 cups flour, 1 tsp. salt, and 2 Tbs. sugar to your mixing bowl. 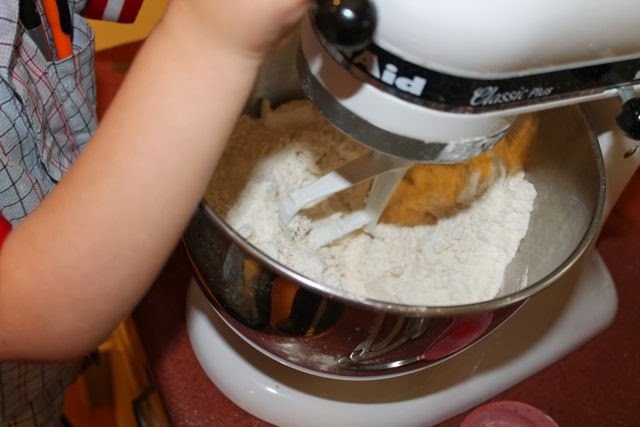 Then, mix until blended. 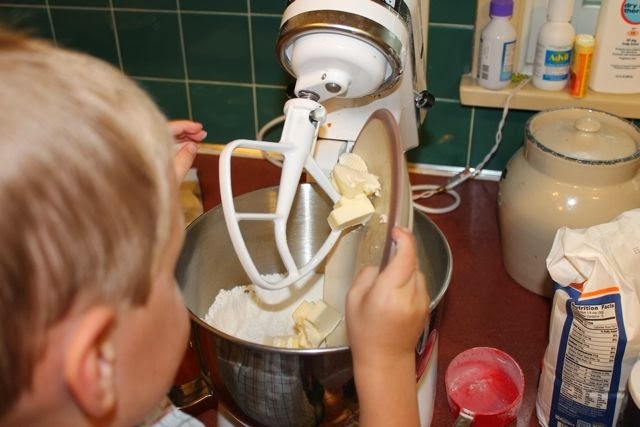 Cut the two sticks of butter into small chunks or slices. 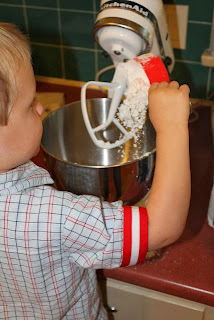 Then, added to mixing bowl with the flour mixture. Mix on low for about a minute so the flour doesn't fly all over the place. 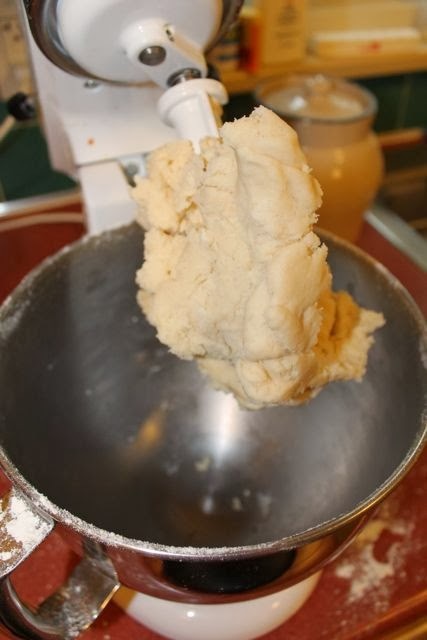 Then, increase the speed and mix for about 90 seconds or until you can't see the butter chunks any more. It should look like this. Then, add 6 Tbs. of ice water and beat on low for about 20-30 seconds. The dough should look like this. Scrap the dough off the mixing paddle into the bowl. Divide the dough in half on top of two pieces of plastic wrap and flatten. 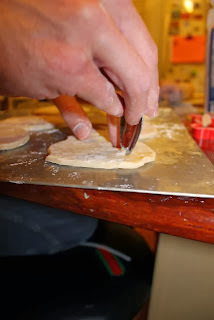 Then, wrap the dough completely and store in the refrigerator for at least 2 hours. 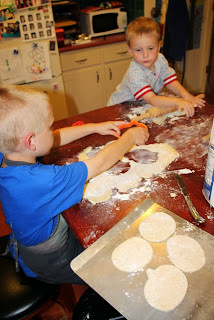 Now comes the fun part! 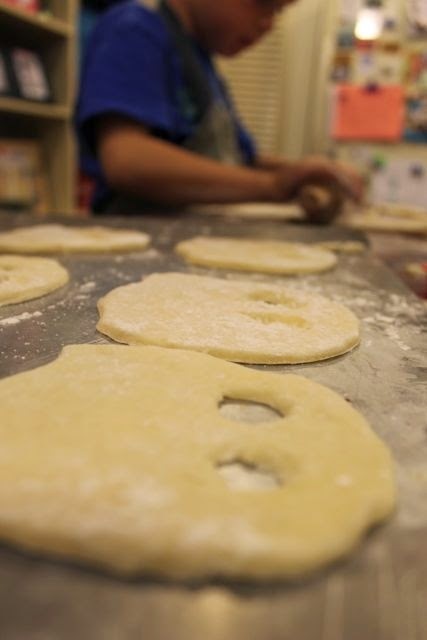 Roll out your dough and use flour when necessary. You would think that a guy who writes children's books and blogs about ghosts would have a ghost cookie cutter. But, I don't! 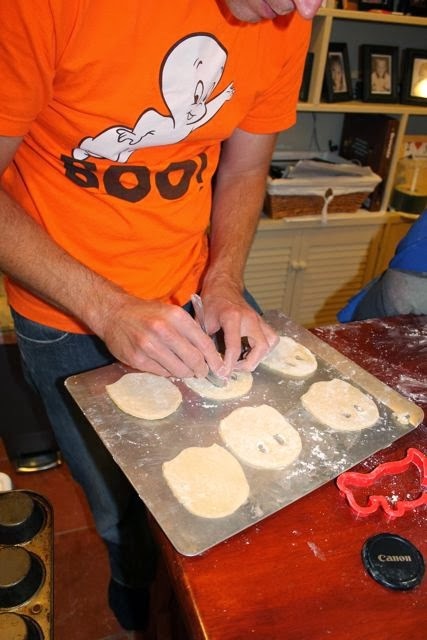 I improvised with pumpkin and dinosaur cookie cutters. I found that once you have the basic shape you can form the ghosts with your hands. 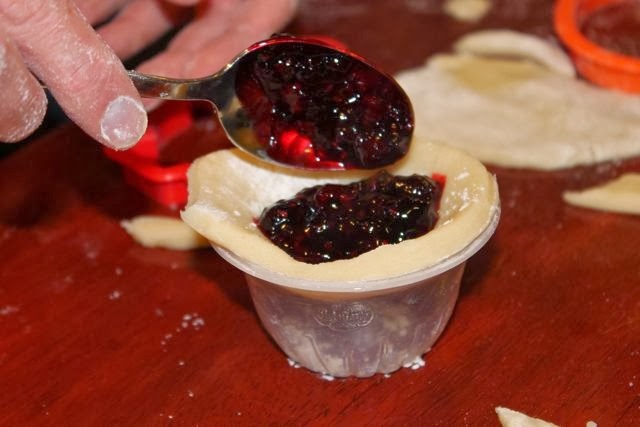 The recipe makes about eight mini-pies. But, you will need a bottom ghost piece and a top ghost piece with eyes cut out. So, that is sixteen ghost cutouts. 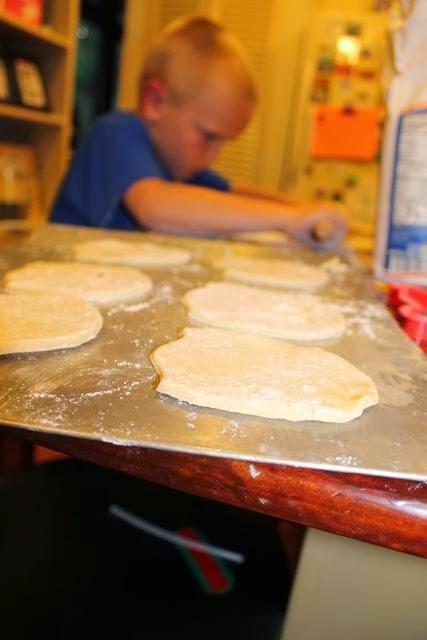 My little helper in the background working hard with his dough. I used a spoon to carve out the eyes on eight of the ghosts. 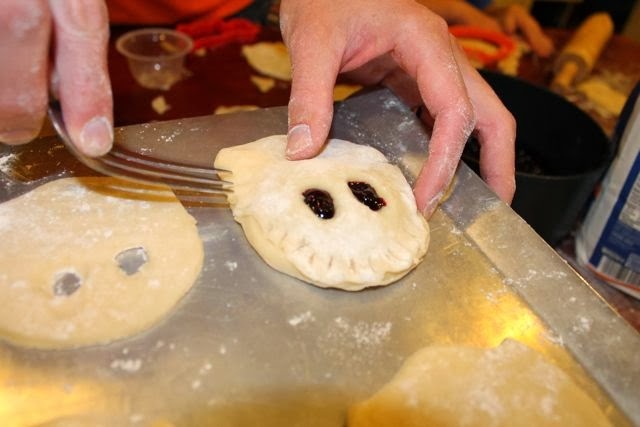 Then, I formed the eye holes with my finger. 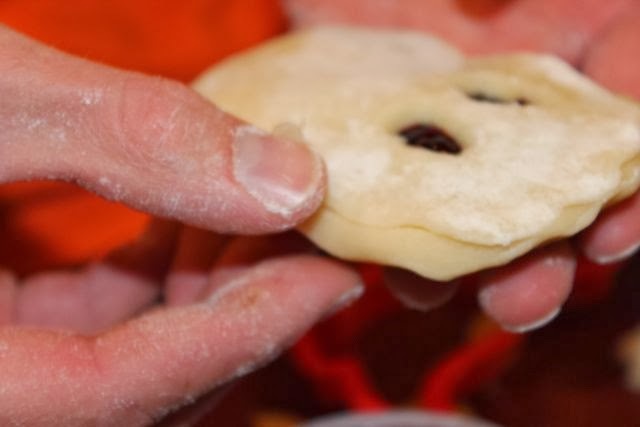 I really don't think this is completely necessary, but I used a plastic container to give the bottom piece of the dough an indentation to place the berry filling. Then, I placed a dough piece with eyes on top. 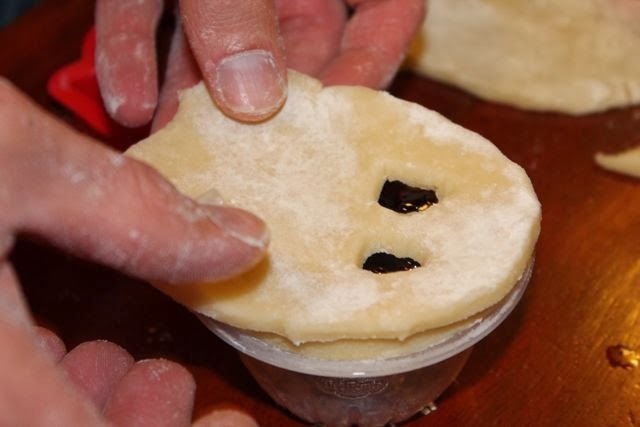 I used a fork to crimp the edges. I forgot to take more pictures after this step. 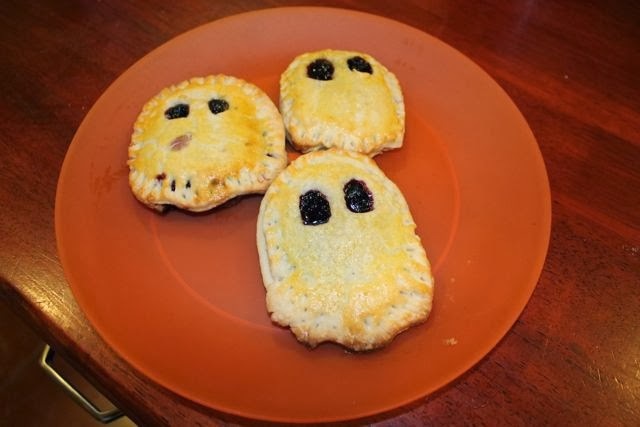 But, once I made all the ghost mini-pies I placed them in the freezer for 30 minutes. 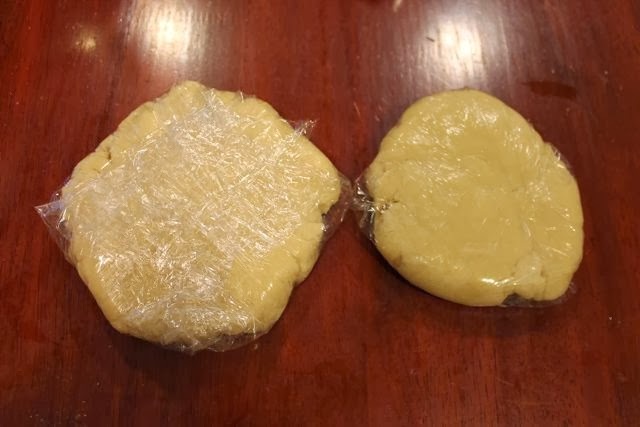 After 30 minutes, I removed them from the freezer and brushed them with the beaten egg and 1 Tbs. water. I baked them in a 400 degree oven for 15-20 minutes. "Ooooooooooo! 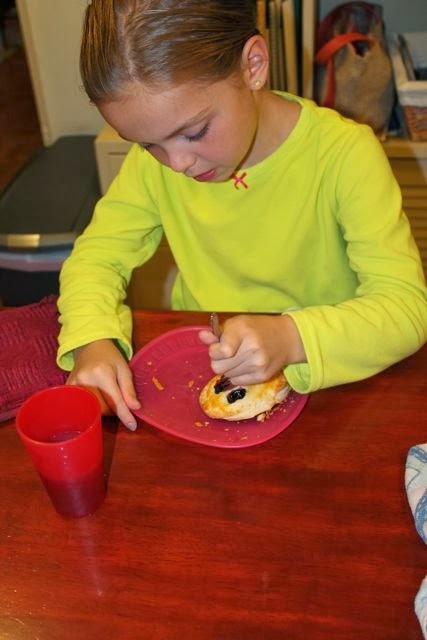 This is a yummy bedtime snack!" This would be great paired with Ghost Vanilla Ice Cream!